I promised in my last post that I would share my attempt over the holidays to soothe my cravings for Ben's cookies by making these triple chocolate and pecan cookies. They're a bit different from Ben's - I used both dark and white chocolate, and they have walnuts rather than pecans. Thinking about it, I'm fairly sure that Ben's don't have nuts in the actual dough, either. But most of all it's the volume - these are fairly flat, even sunken - whereas Ben's have big domes. 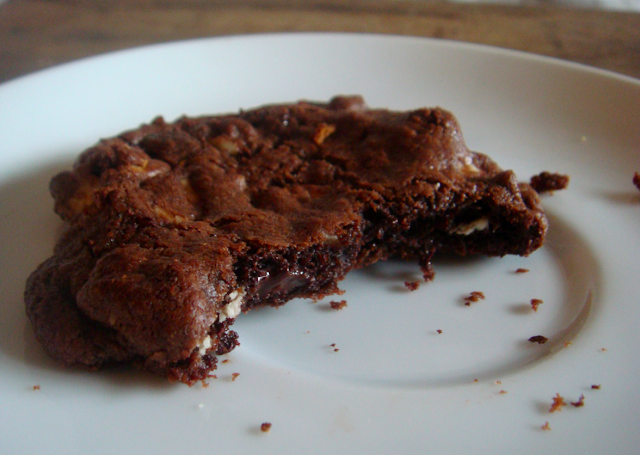 They're also a bit too crispy in places - I want some chewiness, and a more brownie-like consistency. I'm going on work on that over the summer. I think one starting point will be Erin Cooks' recipe for Thick and Chewy Chocolate Chip Cookies. By the time I graduate I want to be able to recreate them perfectly! I'm much more of a fan of pecans than of walnuts - I find walnuts often have a funny aftertaste. In a similar way I always thought macadamia nuts had a really metallic taste. Pecans almost always hit the spot, though, especially when toasted. The white chocolate chips I used were left over from decorating Mum's Birthday Cake, and I think some 'real' white chocolate would have improved them. They weren't half bad chips - but a lump of Green and Blacks or similarly cocoa-butter rich type. For some reason the supermarkets in town at home only have pretty shoddy white chocolate. Perhaps if we went down into the valley it would be better. Despite the fact they're not Ben's, they're not quite tall enough, etc etc, they really are quite lovely. The nutty muscovado and the pecans go beautifully and the chocolate melds into the dough, yet you still get pockets of melted chocolate. The pile disappeared really very quickly. Preheat oven to 180C/350F. Toast the pecans in a dry saucepan or in the oven for 4-5 minutes or until they smell nutty and look slightly darker, then leave them to cool. Beat the butter and sugar together until well combined. Add the egg, then sift in the flour, cocoa, baking powder, bicarbonate of soda and salt and beat just until combined. 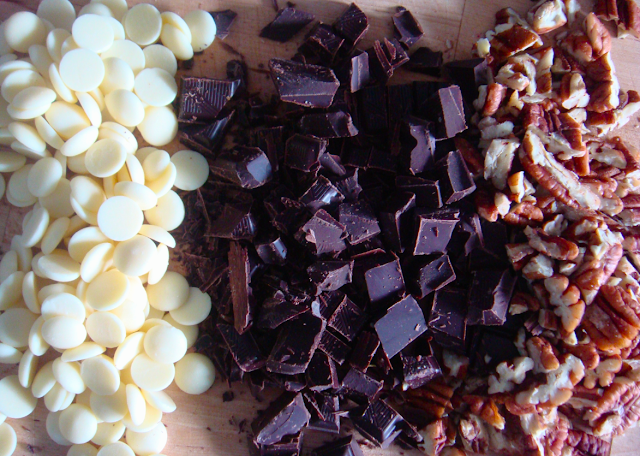 Chop and stir in the pecans and both types of chocolate. Scoop out balls of dough and place on lined baking sheets, with at least 4cm or so between them. Squish slightly. Bake for 8-10 minutes, or until they look set in the centres. Remove from oven and let cool on the tray for five minutes before removing to a wire rack. The dough keeps for at least a day in the fridge. I often freeze the balls of dough and then bake from frozen, which takes an additional 1-2 minutes. They keep in the freezer for up to two months. On my cookie list, these make the top by far! They are fantastically delicious!!! Oh dear! Your comment made me actually lol. It's a favourite recipe of mine - it always works. 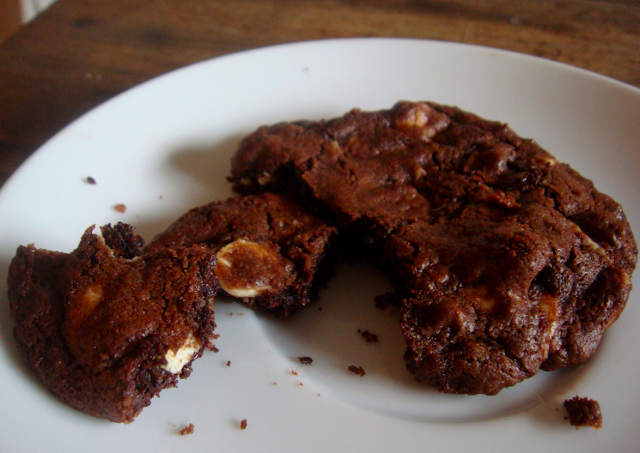 I've just made them and they are so, so good! Because my test cookie started to burn around the edges after 8 minutes in the oven, I ended up turning the fan of my oven off (baking them at 175 'normal oven'). Then they came out perfectly baked! That's good to know, thank you for the feedback! I'm so glad you like them. Hi Emma, just tried the link to the improved version and it doesn't work - does the post still exist? Sorry for the confusion, I'm having problems with that post. I'd only added an extra pinch of salt to the recipe so you can go ahead with this one if you like. Hi Emma, found your blog after coming back from London (Aussie girl) and having serious Bens Cookies cravings....and lucky for me found your recipe. I have to say these remind me exactly of them, thank you. I have made these too many times to count and am now an avid follower of your blog.